Ideal “bend to fit” static positioning dorsal resting hand is ideal for controlling supination of the wrist and forearm or hyperextension of the wrist. Orthotic therapy for significant rotation of the wrist/hand/forearm with mild to moderate contracture of the wrist, hand and fingers or to treat hyperextension of the wrist. Ideal for incremental correction of supination of the wrist/hand with contracture of the wrist, hand and fingers or hyperextension of the wrist. 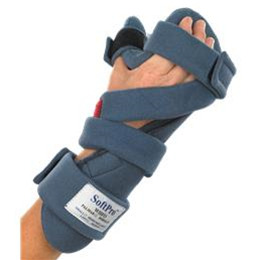 The orthotic device is extremely soft and light yet durable enough to provide significant support and protection. The “Bend to Fit” insert requires no tools to accommodate the specific condition of the wrist, hand and fingers. Non-fixed contractures associated with immobility can incrementally be treated by progressive extension orthotic therapy. The brace is hand molded to 5° to 10° of additional extension in the finger pan, at the wrist, or in the thumb. The strapping system allows the fitter to bring the straps directly over the affected joint to initiate a progressive stretch of the affected joints. The orthotic device can achieve and maintain the hand in a functional neutral resting position. Total End Range Time (TERT) to achieve a positive outcome should be increased gradually up to six hours per day to patient tolerance as recommended by the physician. Orthotic treatment should be continued until function is restored to the affected hand. “Bend-to-Fit” – Easily adjust to correct alignment & support joints without the use of a heat gun. SMALL SP 31FDR-S (left or right) 2 1/2" - 3" 10"
MEDIUM SP 31FDR-M (left or right) 3" - 3 1/2"	11"
LARGE SP 31FDR-L (left or right) 3 1/2" - 4" 12"